There's no indication that Brunschwig's concoctions made good on their many promises; if your marriage is on the rocks, no flower or herb is likely to save it. 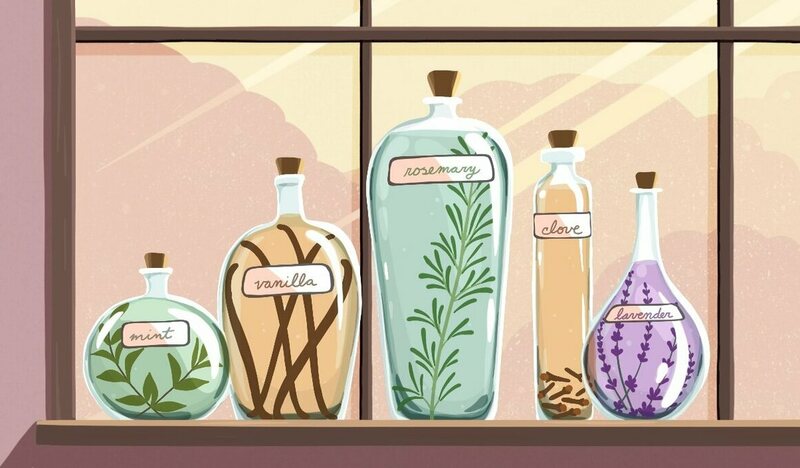 While herbal remedies remain popular throughout much of the world, they're not typically tested or regulated the way modern medicines are. As a result, in many places, including the United States, sellers aren't allowed to market essential oils or other contemporary tinctures as cures for specific diseases. Theoretical curative properties aside, there are delicious reasons to extract flavors from plants. Compared with the complicated process of distillation, infusion (the method of stewing petals, stalks, or leaves in alcohol, oil, honey, or water) is nearly foolproof. Steeped in tradition, it's an easy and affordable way to jazz up foods and drinks from trifles to tipples. Besides your plant material, you only need high-proof alcohol. The higher the proof, the faster the infusion happens, Lohman says—and if it’s really high, around 180-proof (meaning it’s 90 percent alcohol and 10 percent water), you’ll likely need to cut it with water in order to douse the burn. Vanilla extract, for instance, is 70-proof, so it’s 35 percent alcohol. “You make the infusion at a higher proof, and then you usually add water to bring down the proof to a comestible level,” Lohman says. If you have a cup of Everclear and a cup of water, for instance, you’ve slashed the proof in half—from roughly 90 percent to 45 percent. For flavored spirits, such as things you’d add to cocktails, you’d want to hover around 20 or 25 percent. Keep on adding splashes of water until you get there. Place the plastic container in a sunny windowsill, and then leave it alone for at least 24 hours. Since high-proof alcohol kills whatever microbes cross its path, you don’t have to worry about things getting funky the longer you leave your concoction stewing. “The worst-case scenario is that you make something you don’t like the taste of and you throw it out,” Lohman says. That said, you’ll want to test your infusion daily so that the flavor doesn’t get stronger than you like. A little clove goes a long way, while something like basil or thyme will be more subtle. To get a punchy flavor, you’ll either need to begin with more plant material or let the infusion sit around longer. This is where tasting is crucial. A delicate flavor, such as wheatgrass, might take a few weeks to develop, while a more-aggressive lavender comes through in just two or three days—anything beyond that might be overbearing. On the other hand, if the flavor is too toothless, you can keep adding more of the ingredients—one vanilla pod here, a clove there. “It’s a little bit of trial and error,” Lohman says. As you experiment, keep a log of the tweaks you make. This makes the whole thing replicable, if things go well—and if they don’t, you know what to change in the next go-around. Once you’ve arrived at the flavor you want, you’ll need to fish out or strain the plant material so that the flavor doesn’t keep evolving. The finished product makes a creative, inexpensive gift. “At this point, you’ve bought a bottle of vodka, plucked some stuff from the garden, and that’s it,” Lohman says. “It’s a very low-risk at-home hobby.” Not to mention a delicious way to tap into an ancient practice, with a modern twist.